After going to a firework display this weekend, I got to thinking of entertainment at weddings. Everyone wants their wedding to be memorable, both you as a couple, but also for your guests. There are lots of ways to add a little something extra to your day. Below are a few suggestions and things to consider if you want to feature one or even all of them! This can encompass anything from fire breathers to belly dancers, even aerial acrobats with champagne chandeliers! Jugglers and dancers can roam freely throughout your guests involving them in acts if you wish. However, always check with your venue that they are happy to accommodate these artists. Many aerial acrobats can provide their own rigging so there isn’t usually a need for venues to worry about that aspect. That said they may specify fire displays can only be featured outside, something to consider if choosing a venue with limited outdoor space. Why not have someone create mini pictures of your wedding guests for them to take home. Caricaturists can fit into almost any time of your day. Have them wander around during your cocktail hour; entertain guests during the wedding breakfast or catch the crazy poses people will strike later in the evening! Warble Entertainment, Corporate and Wedding entertainers provide caricaturists for weddings. Able to draw 10-15 people per hour some offer pre-designed paper featuring your names and wedding date, enabling you to use them as favours too! An artist usually captures the essence of your day, rather than individual guests. They arrive a few hours before guests to draw the scene, spending the rest of the day filling in the detail whilst your guests look on. At the end you will have a unique momento of your day to hang on your wall. Picture the scene, you’re all seated ready to begin your meal when suddenly, the staff who moments ago were topping up your wine glass have everyone joining in for a rendition of ‘500 miles’! A real ice breaker, they can be a really good fun way to get all your guests involved in your day early on. Singing Waiters take time building a rapport with your guests from the moment they arrive ensuring everyone feels part of the event. Some acts will also include a DJ for the evening as part of their package, offering entertainment for the whole day. Whilst you may not consider lighting as entertainment, the effects it can have on your reception and guests can be just as memorable. Lighting can totally change the look and feel of a venue and be a surprisingly affordable way to decorate it. Uplighters can highlight particular features within a room for example picking out beams within a barn. Coloured lights can change a plain, blank venue to a beautiful reception and can even reflect your wedding colour palette. A marquee erected around a fountain or statue for example could use lighting to highlight the feature. While a star light effect creates a magical evening ambiance. Neon lights are very popular at the moment and offer a great backdrop for photos while candles create that romantic glow. Want to end your party with a bang, sorry pun intended! 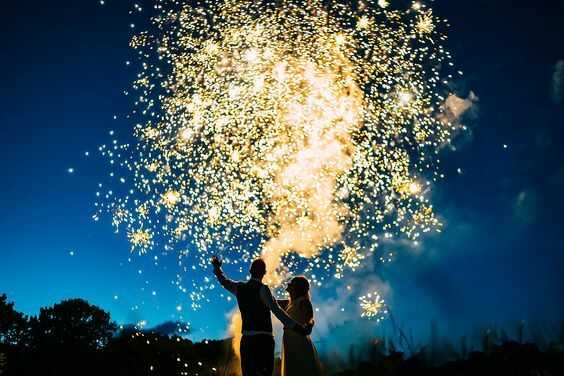 Fireworks can be an amazing end to your night, or if you’re having a winter wedding a great way to start the evening celebrations. Ensure you let your photographer know you will be having fireworks and check they will still be there when they go off. Fireworks can create a fantastic backdrop for some magical photos. If your photographer will have left, consider whether you might be able to get some shots with sparklers? Although always ensure you and your guests use them sensibly, sparks and wedding dresses don’t mix! Always ensure you check with your venue that fireworks are allowed, before booking. Some venues won’t allow them due to noise restrictions e.g. they might be in a residential area, others may not have a suitable location to set them off. If your venue is happy, they will most likely require that you use a professional firework display company who are fully insured. Without wishing to sound like your Mum, fireworks are dangerous and the choice to have them shouldn’t be taken lightly. Always ensure everyone stays safe. If you’re still looking for ways to add that extra wow factor to your day but stumped for ideas or don’t know how to make it happen, get in touch with Wild Wedding Company to find out how we could help.